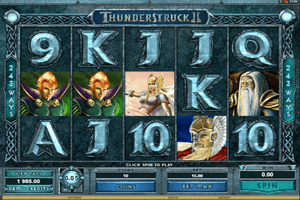 Thunderstruck II invites players to get to enjoy yet another experience that is themed around the mythical gods of the Norse that were worshipped by millions of Viking warriors. The game has a higher paying format, the 243 ways to win format, and 5 reels. It also comes packed with a wonderful set of payouts, whether by forming combos with matching symbols or through the Great Hall of Spins and the other special symbols that the slot has. Play Thunderstruck II Slot here. The symbols that land on the reels of the game include Thor and his mighty hammer, Freya, Odin, Loki, Asgard and card symbols. As was mentioned above, the Great Hall of Spins is the bonus round of this slot machine and it is activated when players get 3x Thor Hammer symbols on the reels of the game. They will then earn a number of free spins and other additional features depending on the god character they chose. There is also a wild icon, whish resembles the joker in a deck of cards, it is the Logo of the game symbol. It replaces all other symbols, with the exception of the other special bonus symbols, to help players in creating a winning combo and get paid. All of this shows how rewarding Thunderstruck II can be.